Article first published as TV Review: THE ALIENIST on Seat42F. TNT begins a new chapter in their programming with THE ALIENIST. An alienist has nothing to do with extraterrestrials, though TNT has done their share of that type of show. Instead, the term, considered archaic now, refers to someone who practices psychiatry. Which, if you’re following along, means the series is about a person who studies the human psyche in a bygone era. A period piece drama is not the normal fare you’d expect from the network. But does it work? Not quite. The pacing is slow and the plot is dreadfully plodding. The first word that comes to mind to describe THE ALIENIST is boring. I don’t care about the characters, nor their motivations, which is not a sustainable model for a television show. 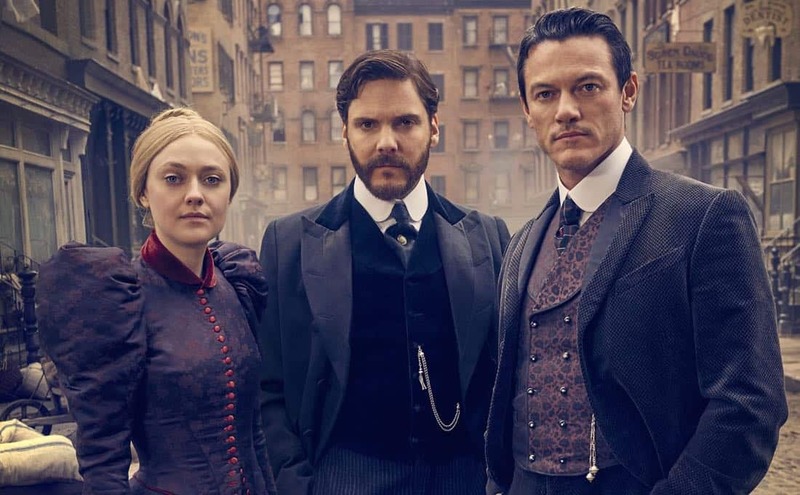 TNT is known for works that are fast-paced and somewhat cheesy, so THE ALIENIST is a departure, and that by itself is good. Care has been taken with sets and costumes, so it looks good. This is especially true in an early sequence on a wooden bridge. There aren’t the usual plot holes and cliché dialogue that other programs on the network have contained. The acting is quality, as is the directing. So it’s not the individual elements that are the problem here. THE ALIENIST stars Daniel Bruhl (Captain America: Civil War) as Dr. Laszlo Kreizler, a doctor who works with the mentally disturbed and tries to treat them. Not cure them, mind you, but make their conditions more manageable. He is assisted by John Moore (Luke Evans, 2017’s Beauty and the Beast), an illustrator who helps Dr. Kreizler see things he cannot, a second pair of eyes who provides other perspective. Rounding out the central trio is Sara Howard (Dakota Fanning, The Runaways), a police clerk who is interested in following the law, but is intrigued by the doctor’s work when it seems more reliable than the old techniques. These three are decent actors, as anyone who’s seen them in other works can attest. Fanning, once a child actor who has starred in respected films, makes her first foray into series television, and Evans and Bruhl have had some success on screens both large and small. I can’t point to any of the trio as a weak link. The three begin by trying to clear the name of a man sentenced to death. I would say there is some moral quandary as to whether they should, as the accused is suffering from painful, incurable syphilis anyway. But as all good classic heroes, they are committed to truth and justice, and so seek not just the extension of their ground-breaking work, but to use it to help people, too. It’s not this somewhat tired premise that spurs the bad review. Although it seems similar to a couple of recent streaming and cable shows, also period pieces, the trappings of the setting and the way the story plays out distract enough from the common formula. It’s just the overall tone, which doesn’t rise to the level of the style of the piece. THE ALIENIST is also very gory. Gory enough that I couldn’t see it on basic cable in the pre-Walking Dead days. This choice fits well with the story they’re telling, being brutally up front at showing things, not glossing over and romanticizing. In that, I do think the show made the right decision, supporting the premise and plot. In the end, I must conclude that the show is decent, certainly a step up for TNT, but lacks the charm, intensity, and magnetism that many of the best shows today have. THE ALIENIST airs Monday evenings on TNT.